It's Tuesday, and that means it's New Release Day! Every Tuesday. New Releases! It doesn't get much better than that when you're a stamp collector like I am! I just wish I could color as fast as I can collect them! I colored Pumpkin Crow with Copic markers, but I also think it would look great with colored pencils or crayons, or anything else you decide to use! Papers on this card are from We Are 3 Digital Shop. The orange dot paper is from the Pumpkin Delight paper collection. The green vine paper is from the Thankful paper collection. The sentiment, also from We Are 3, is part of the Itty Bitty Fall collection. The die cut leaves are from Yvonne Creations, and can be purchased at Dies R Us. 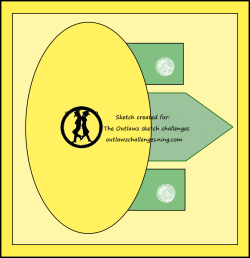 The oval shapes were cut out with Spellbinders dies. 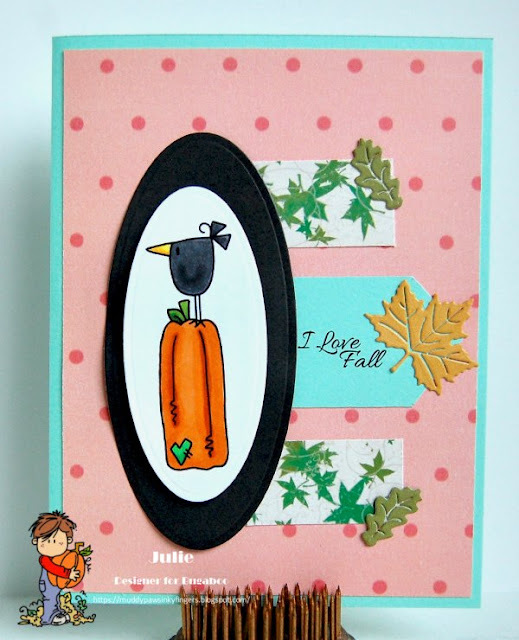 I hope you check out what the rest of the Bugaboo Stamps design team made with this Pumpkin Crow new release on the Catch the Bug blog. You won't be disappointed! Julie, this is adorable, and great take on the sketch.